抱擁 嵐 Take a guess Shake your head? A・RA・SHI 嵐 はじけりゃ Yea! 素直に Good! Are you ready now? 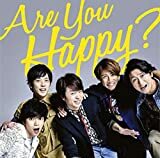 嵐 Let's go - Are you ready now? Dive into the future 嵐 Hey hey Dive into the future!